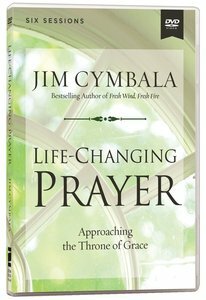 In this 6-session DVD-based Bible study, Jim Cymbala, pastor of Brooklyn Tabernacle, shares the truths he has learned about prayer; truths that transformed his church from a struggling inner-city congregation to a thriving community that prays with passion, focus, and faith! Study Guide (#489912) sold separately. About "Life-Changing Prayer: Approaching the Throne of Grace DVD (Video Study)"
God's throne of grace. It is not a physical location you can visit, but the promises you read about it in the Bible are so immense that they are almost beyond belief. And as Hebrews 4:16 states, you can always "approach God's throne of grace with confidence," knowing that you will "receive mercy and find grace" to help you in your time of need. In this six-session video-based Bible study (guide sold separately), Pastor Jim Cymbala explores how God promises in his Word to always hear you, answer you, and extend his mercy when you come to him. As you pray with faith, he will provide his perfect peace and "meet all your needs according to the riches of his glory" (Philippians 4:19). You will find that approaching God's throne of grace will change your life and circumstances like nothing else-and that when you and other believers call on his name, powerful things happen in the world!